While these two teams are big names in the European basketball circuit, this will only be the eighth time that these two sides clash. History is very much with the Catalonians as they have managed to win all 7 of the previous games between these sides. However, both teams are having a tricky time at the moment and with home advantage, and the confidence of a win in their last game, Galatasaray will fancy their chances in this match. The hosts hold a 2-6 record but as they actually won their most recent game, they will be feeling slightly better about themselves heading into this game. They will be looking for Justin Dentmon to lift the side and give them a chance of creating a bit of history against the Catalan side. He has averaged 13.4 points per game this season, while he has been ably assisted by players like Austin Daye, who has delivered an average of 11 points per game and Sinan Guler, who has offered an average of 10.3 points per game. If these players step up, the Turkish side may be in for a good evening. The hosts have the fifth best offensive record in the league, with an average of 84.5 points per game while they hold the weakest defence in the league, shipping 92.5 points per game. Conversely, Barcelona, even allowing for the mauling they received last week against Real Madrid, have the second best defensive record in the league, offering up an average of 75.2 points per game. However, the Catalan side has struggled to score points and they have the weakest offensive record in the league, coming in at 71.2 points per game. Tyrese Rice is the leading player for Barcelona, offering an average of 15.8 points per game and Ante Tomic is next in line, with an average of only 8.3 points per game. The Catalan side have history on their side but they have endured a tough time of late. 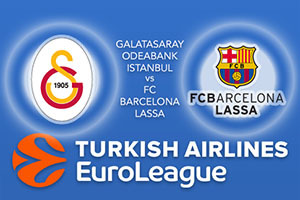 However, you should take FC Barcelona Lassa at -3.5 which you can find at odds of 1.90. With the Over/Under market, you can opt for going OVER 159.0 which is provided at odds of 1.90. Bet Now!